# 1 Audie Murphy suffered throughout his post-war life with PTSD (post traumatic stress disorder). While it is a common word in today’s Army, not much was known about it at his time. Most medical experts of the time simply diagnosed him with insomnia and chronic nightmares. # 2 Audie was one of twelve children. Audie grew up on a farm in Texas where he had to help his mother support their family. His father’s desertion drove Audie to join the military to honor his mother. # 3 Audie joined the Army when he was 18. Although, there is some confusion about his birth date because his sister Corrine altered his birth certificate when he tried to enlist in 1941. Some sources list it as 1924 and others say 1926, whatever it was, he was a very young man. # 4 After witnessing his friends death at the hands of a “surrendering” German, Audie Murphy was awarded the Distinguished Service Cross for his actions in commandeering the German machine gun and grenades and killing the remaining Germans. # 5 Audie was awarded 33 U.S. military medals, including three Purple Hearts and one Medal of Honor. # 6 Murphy was wounded in the right heel and ankle by shrapnel on September 15, 1944. He received a serious wound to his right hip on October 26, 1944 from a shot by a sniper, which required 3 months of recovery. On January 25, 1945, the day of the action which resulted in him being awarded the Congressional Medal of Honor, he received another shrapnel wound to his left leg. Considering that most Medal of Honor winners are awarded the medal posthumously, it is amazing to me that he was only slightly wounded during the incident that resulted in him receiving our country’s highest honor. # 7 Audie served in the Texas National Guard. See “Top 5 Famous Army National Guard Officers” article. # 8 LIFE magazine honored the brave, baby-faced Soldier by putting him on the cover of their July 16, 1945 issue. # 9 In 1949, he published his autobiography, “To Hell and Back.” Then, in 1955 he decided to act and portray himself in the film based on his book. Audie made a great acting career by starring in over 40 films. # 10 Audie Murphy became an esteemed country music singer. Audie wrote numerous Country and Western songs, 17 of which were recorded by Eddy Arnold, Dean Martin, Porter Waggoner, Jimmy Dean, Teresa Brewer, Roy Clark and many others. His most popular songs were “When the Wind Blows in Chicago” and “Shutters and Boards”. # 11-Audie Murphy squandered his entire fortune and fame on gambling and bad investments. He also became addicted to sleeping pills. # 12 -Audie died in a plane crash in 1971. He is buried at Arlington National Cemetery. Thanks for reading my 12 facts about Audie Murphy. As you can see, Audie lived an incredible life and did many great things for his country. He is considered to be one of the greatest Soldiers of all time. What other facts do you know about Audie Murphy? Share your comments or questions below. Thank you. Next Next post: How Should a Platoon Leader Interact with Their Soldiers? Now that PTSD is such a commonly heard term, I think people can look back on old war heroes like Audie Murphy and understand more about the rest of his life and how it played out. It’s a damn shame that he died without having known about this, even though I am sure he knew that something changed in him fundamentally after WWII. Here’s a neat fact about Audie Murphy: he acted in 44 films. Great story about one of the most interesting military people in recent history. There still remains a question about Audie’s birth year. Apparently his sister said that he “augmented” his age in order to enlist and the error made it into official documents. And last time I checked, you can see some of Murphy’s country music songs on YouTube. He truly was an extraordinary guy who died way before his time. Great post, Larry. Audie Murphy was a great Soldier and actor. It’s too bad he died so young. Who knows what else he might have accomplished. Thanks for another great post. Audie Murphy is one of my favorite “war heroes” of all time. I love his movie “To Hell and Back.” His story is inspiring and shows that you can never prejudge how or what a Soldier will do in combat. What an amazing life! I am familiar with Audie Murphy as a country music singer, but was painfully ignorant about his honorable service in our military. Had the field of medicine been more advanced or aware of PTSD, just think of how much more Mr. Murphy would have been able to achieve in life. Thanks for the comment Faye. 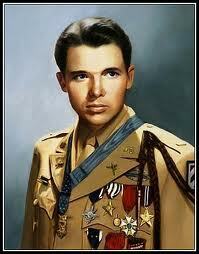 Audie Murphy did live an amazing life, one most people only dream of. Not only was he a war hero from humble beginnings, but he had a very successful acting career. Like you mentioned, it’s too bad he had PTSD. It’s hard to imagine the pain and mental suffering he experienced all those years after the war. Thanks for the post, Faye. I also find it amazing that Audie’s PTSD was so overlooked at the time. Not only with respect to HIS life, but think about what we could do today if we understood PTSD during HIS time!? Our military has fought in combat throughout our entire history and PTSD is only now becoming common language throughout our nation. Again, thanks for the great feedback on the article, I appreciate it!